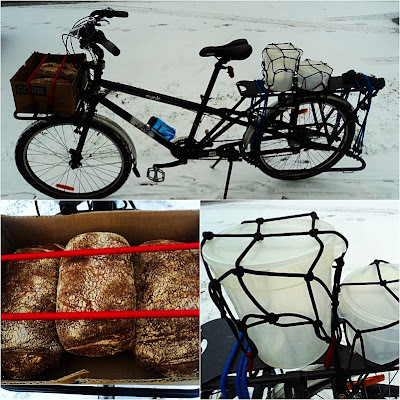 A cardboard box containing three loaves of just-baked and still-warm Ezekiel Bread (I let them cool off on the ride home...9F/-12C outside as I rode home). Two plastic dough rising buckets (one my way to work this morning one held the bubbling Ezekiel biga and the other its autolyse). For Ezekiel Bread Recipes, or for more information about it, click here or here.